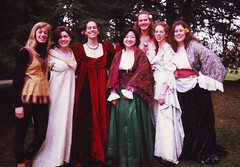 In January of 1993, a woman named Kate put out the word that she was looking for people who were interested in singing madrigals during Winter Study, Williams College's January term. My dear friend David told me in no uncertain terms that he was going, and he was dragging me with him. I was mourning the break-up of my first real relationship, and I was morose; he knew that singing would cheer me. I was as dubious about that proposition as only a self-centered and heartbroken seventeen-year-old could be, but I agreed to give it a try. To my surprise, David turned out to be right. The singing was grand, and it lifted me out of myself. We had so much fun during Winter Study that, when the spring semester began, we decided to constitute ourselves as a "real" a cappella group, specializing in madrigals and early Renaissance music. David and Kate became the group's first pair of directors, and they opened auditions to the campus-at-large. To my great relief, I made it into the group. Once the group's line-up was settled, we spent an afternoon brainstorming names. And the name we chose for ourselves was the Elizabethans. The women, and the men, of the Elizabethans. Spring 1994. I sang with the 'bethans all four years of college, and the year afterwards, too, when I was working at the college bookstore. 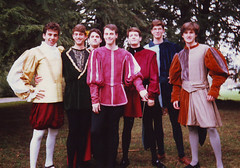 Infinite hours of rehearsals -- concerts on campus, music interspersed with skits and patter and silliness -- annual tours when we packed ourselves into a college van or two and drove all over the Northeast (and sometimes as far south as North Carolina) to perform at colleges and churches, doing guest stints with other madrigal groups, singing wherever we could line up a gig, and then cooking meals for ourselves at night in borrowed kitchens -- these make up some of my fondest college memories. It turns out that the era of making memories with the Elizabethans isn't over. Not entirely, anyway. 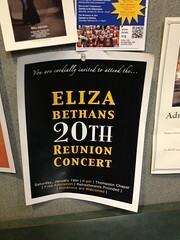 Concert flyer, 20th Reunion Concert, this past weekend. 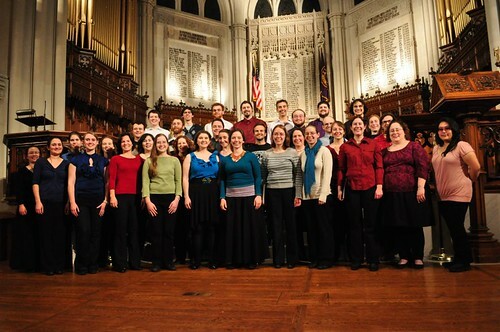 And this past weekend, we did it again, putting on a concert in celebration of the group's 20th anniversary. Singing with the Elizabethans again was a real joy. I love this music. I love singing a cappella, especially madrigals and renaissance music, especially with other people who love the singing as much as I do. There's something deeply meaningful for me about the experience of joining my voice in song with other people, shaping my voice to fit with theirs, collaborating to create something beautiful and ineffable, more than the sum of its parts. And I love having the chance to sing again with people I've been singing with for twenty years. That's a tremendous gift. I'm grateful for the opportunity to sing beautiful music with old friends and new friends alike, and to share our combined voices with the local community. Singing in this way is prayerful, for me, whether the repertoire is sacred (medieval and Renaissance church music) or secular (madrigals on all of the classical themes, shepherdesses and romance and so forth.) Singing with the 'bethans has always felt to me like prayer: even when the words we're singing are frivolous, or when they arise out a theology which isn't my own, the act of singing in harmony is for me an act of offering praise. Thanks for twenty years, y'all. Here's to another concert in 2018!